Why Diverse Industries need Effective Software Quality Assurance? According to a recent Gartner report, information security services, especially IT outsourcing, consulting and implementation services, will continue to be the fastest growing segment. The research further states that security services, especially IT outsourcing, consulting and implementation services, will continue to rise. Likewise, the worldwide software testing outsourcing market is expected to grow from $30 Billion in 2010 to $50 Billion in 2020. Software Development with good software testing approach is a pressing need for every enterprise today. Whether it’s a banking/financial application, an ERP solution, a software for the Airlines industry, a software support for the Defense forces, or a high speed online gaming application; software testing is an inseparable aspect of the development process. Along with software development even software testing has evolved over a period of time. Agile, DevOps, Shift-left, Shift-right, Service Virtualization and many more new age approaches have revolutionized the way software testing is conducted. The underlying idea is to accelerate time to market and ensure quality. Industries across diverse sectors need faster turnaround and risk-free performance as well. Moreover, Digital Transformation is further changing the software development and testing landscape. 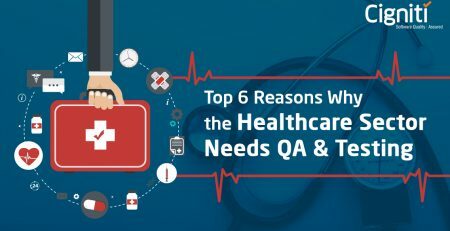 While the need for software quality assurance is justified and established, it is important to understand the inherent reasons why some industries take software testing so diligently. We have put together these key areas for some select industries where software testing and quality assurance are indispensable. The software services market and majorly the application development scenario has been eternally threatened by cyber-attacks and probing viruses. This makes security a major concern for the banking and financial services sector that works on the premise of a secure environment for its users. An increasing number of users are getting on to the mobile platform to access their bank accounts and make significant transactions. Digitization is working towards enhancing customer experience, but is equally threatening security levels at every stage. While Banks and financial institutions are trying to extend the benefits of Digital Transformation to the customers, there is a growing risk to the customer’s financial data in the online space. Fraudsters and hackers are coming up with innovative ways to penetrate into the application’s software and spreading uncertainty. Money being a key motive, highly sensitive customer data is also used for malicious objectives. Security Testing with its various methodologies helps to detect and weed out any possible vulnerabilities and provides a long-term solution. Additionally, it requires thorough understanding of the sector and expertise to not only deal with the current risks, but also strategize a comprehensive Quality Assurance plan. Cyber-crime is growing and the banking sector poses immense vulnerabilities. Every second day you tend to stumble upon a new ad announcing a big sale on an ecommerce portal, and there are chances that the sale runs down into a fiasco due to website crash! Instances related to website crash and performance issues are increasing due to inadequate quality assurance and software testing. This reinforces the importance of load testing to ensure smooth functioning of the site even during high traffic days. It is critical to scrupulously manage and deal with the website traffic to perform multiple transactions concurrently. Despite constant predictions and traffic estimates, most of the websites fail to perform even the most mundane functions. With an experienced testing and QA team, organizations can put together a comprehensive Performance Testing plan with load tests. Moreover, Usability Testing is critical for ecommerce websites/applications, as there is loads of dynamic content. It helps to identify and rectify performance issues that can be faced by a potential user. Testing is done under particular scenarios that can even entail real-time user scenarios. Issues such as responsiveness, cluttering, compatibility, and ease of navigation are addressed to ensure that the experience from the website is flawless. Similarly, in a retail set-up software quality assurance is critical to ensure an omni-channel experience for the users. The retail industry is facing its own challenges, where user experience has to be blended with constant innovation. Additionally, Security of the customer data is critical, considering a substantial history of software failures refer to how customer data got stolen from PoS systems at retail stores. Whether it’s virtual or on-ground, a robust QA strategy enables retail sector to stay upbeat in terms of performance and also provide a secure interface. What is critical for the Airlines sector to remain competent? Timely service, enhanced customer experience, and robust crisis management. These are some of the most prominent performance parameters for the Airlines industry. We have been reading regularly about cases where even the tiniest software glitch has resulted in major system failures for prominent international airlines and airports. Airlines is a highly data-centric sector and works on integrated systems, where any kind of glitch can result in a total collapse. The Airlines sector is further utilizing analytics, enhanced levels of regulatory compliance, ecommerce, agile technologies, software as a service, and geographically distributed services a part of its technology strategy. This intensifies the significance of software testing and quality assurance for the airlines sector. With a wide range of airlines flying globally, there is tremendous competition and serious need to woo the potential customers. Only flawless performance and experience can ensure sustainability for the airlines industry. Likewise, Digital Transformation is making all the possible difference and posing challenges for the airlines industry. While there are tremendous opportunities in this new digital era, the challenges can be tackled with a robust software quality assurance strategy. It will help the sector to embrace the benefits of digital transformation. Technology and software is at the core of the Communications industry, and are key enablers of growth. The industry is facing some grave challenges such as driving better revenue streams, dealing with declining margins, need for constant innovation and ensuring availability of service. Technology being an enabler, there is massive need for IT planning and quality assurance. Software Quality Assurance enables the industry to offer better service to the customers and streamline various processes/workflows. The sector is pretty heavy on investments and it needs to ensure the required RoI. Software Quality Assurance helps to segment the users, provide relevant services, assure continuity of service, and manage key aspects such as billing for smooth revenue generation. The industries discussed above could be just a handful, but they comprise and present various factors related to infrastructure, human resources, and technology. Managing all these aspects is important so that growth is ensured along with sustained profitability. Software forms the core of every technology offering and user interface, consequently a critical element to ensure sustainability in the competitive market. Business are increasingly investing in software testing and quality assurance, as this is the only way they can be assured that the customers are provided the required experience. Cigniti’s Advisory and Transformation Services help organizations understand and improve all QA focus areas – people, tools, and infrastructure across the delivery lifecycle. The Advisory Services help clients understand their QA maturity and identify gaps in their processes & practices. Connect with us to build a software quality assurance strategy that is best suited for your business needs. 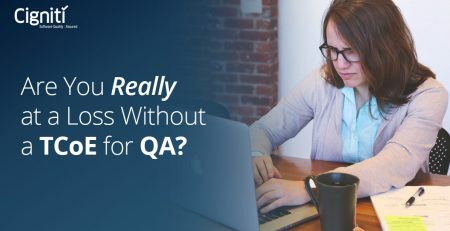 Are You Really at a Loss Without a TCoE for QA? 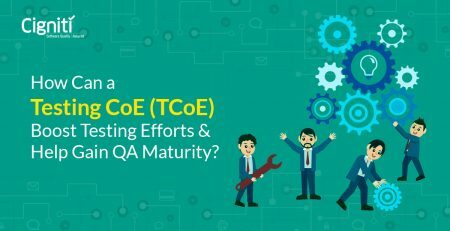 How Can a Testing CoE Boost Testing Efforts and Help Gain QA Maturity?